Star Wars: Episode VIII: Binds of Tyranny Forum Index » Questions and Suggestions » Thrawn's reclamation contest? Very nice to see how you actually TOLD me this was going on. And, considering my ONLY action with Thrawn has been with Ams, and then he left to his secret CMAC account since, I don't think this is fair. Also, 'community' complaints seems to be a strange term...the ONLY IC actions I did was with Ams. But he's CMAC, right? That makes him right. Ams never even LET me explain myself, which I could easily do, with QUOTES from the books. However, you CMAC'ers REALLY hate talking to me, so I don't think you'll even bother. Once again, thanks for letting me know BEFORE you took away my character. And we gave you how many suggestions on things you can do with Thrawn instead of crawling into a hole until the war exploded? No, Xaph. Don't even think of shifting the blame. You deliberately went inactive, in your own words, I might add. It's not that you have nothing to do, it's that you aren't being allowed to loot and pillage like a pirate and pursue a personal vendetta. So, no, Tie... the competition is still alive. What competition? 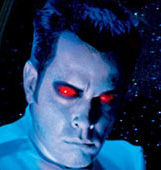 There is nobody else that wants Thrawn besides Xaph as I see it. Where the issue of canon characters is concerned, people do have a right to complain when the character is not played as the books portray. I took a big risk in choosing Jax as my canon character, because there was a very limited playstile I could assign. A reclamation doesn't have to be for someone else, it could simply be to restore canon. Oh no. Don't say that. Everyone knows I'm the biggest Thrawn fanboy. And I'm currently writing up my post. I fully plan on bringing as close to the eight-page limit so that is why it hasn't been posted yet. But I will be entering the contest. That aside, Xaph. Best of luck in the competition. No suggestions. None. Nada. Zilch. All you told me was I'd be doing alot of paper work. I went inactive because I lost the internet for a good time, and you wouldn't give me anything to do, yet you are VERY quick to point out what I CAN'T do. Instead, you hide away from the forum on your secret MSN Address and pretend I don't exist. And this isn't abobut the vendetta, you're just looking for an excuse. I can quote, from the BOOKS my reasoning, as well as backing it up with perfectly reasonable ideas. You just don't want to listen to them. Once again, you have seen yourself as right, and haven't even given me a chance to plead my case. I'm just not worth it to you, though: what have I done? I don't own a corporation, I wasn't around from the beginning, and I'm not everyone's best friend. And then, right away, you blame it on me. It is YOUR fault I went inactive, as EVERYTHING I did was immediatly dismissed as 'a vendetta' or some other crap. Not true. And, you blatantly ignore my statements that I can support using the books. And Nubis, stop being a jackass. Funny, I recall myself and other admins telling you to try developing the character before... I guess those logs must be in error. I can understand not having the Internet, Xaph. However, as I said above, you don't have to constantly be smashing into Geonosis. You could try developing the character. Also, the fact that you had access to the boards before and after your Internet access was removed, and yet you did nothing until the war was in full swing also makes you suspect. Furthermore, Thrawn understands the chain of command... you apparently don't, since my orders were in-character, and yet you still tried to circumvent me, first in the Imperial forums and now here, trying to make yourself seem like a victim. You're not. You just want to hunt down a player you dislike, and I refuse to be a party to it and commit the assets of the faction I am a member of to help. Ergo, I must be at fault for your inactivity? Correction: invading the planet of your enemy was dismissed because plans were already underway, and they don't include "looting" as you put it. And where are these statements and their support, Xaph? WHERE? It's pretty hard to do when you've gone and gotten a new MSN address. Plus, by the time I get them, you'll have raffled off my character. And to think you didn't even tell me is a major insult. And you haven't answered a single one of my claims, have you? I edited with a more in depth answer, Xaph. Stop blaming other people for your problems and mistakes, and own up. Instead, you hide away from the forum on your secret MSN Address and pretend I don't exist. I was told it didn't exist. Am I being made to believe this was in-fact, a lie? My computer didn't like Windows Live Messenger, and I had to track down an older MSN version (Thank you, DJ. ) to install. I do in fact sign on my moffjendob account. So there is a secret account? There was prior to my move up to my dad's. I haven't used it since. [01:41:53 PM] Xaph -=- STE: Is there fighting yet in VIII? [01:43:21 PM] Solo - the R: ? [01:44:23 PM] Solo - the R: i said "?" [01:44:45 PM] Xaph -=- STE: You did. [01:44:45 PM] Xaph -=- STE: I don't know why. [01:44:48 PM] Xaph -=- STE: Because I asked a question. [01:45:46 PM] Xaph -=- STE: And, now you've stopped talking. So, who are you really telling the truth to? It should be noted... anyone can participate in the contest. Ok, there's a reason why I said not to post OOC stuff here. If you want to complain, complain in a new thread. Yeah, uh, how exactly did this fit into the "Suggestions" category? And, when you have a problem with someone, first of all, you don't make a public display to get everyone upset. Second of all, if you're unable to contact someone via MSN, there is something called "E-mail" . Oh, and if that doesn't work, there's also, *drum roll*, PRIVATE MESSAGES! And if you want to resolve a problem, its best not to instantly call them assholes or jackasses. People amazingly don't like that. I'd actually say when your only IC actions are with Ams, you aren't really playing the character at all. Oh yeah, if the entire community thinks you aren't playing him right, then cut with the BS that the CMAC think they are angels. By the way, Nubis, best of luck. Why'd you get rid of him in the first place? Too busy at the time? Either way, it will be interesting to read that 8 pages . I will take the bigger-man route and say that even though you outright insulted me, I still wish you luck in the competition if you so choose to participate. I did nothing to you to deserve what was said. I'd like an apology. Yeah. Without Nubis, we'd have no INTRIGUE FOR THE MASSES.